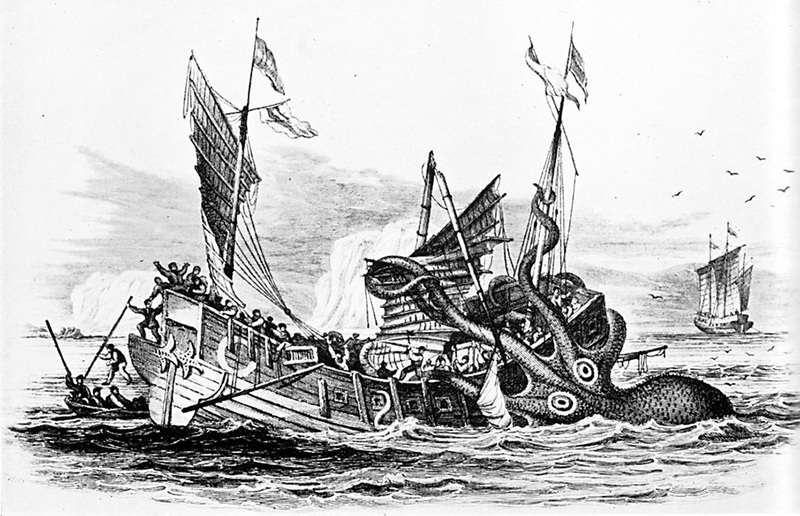 Pierre Denys de Montfort‘s Poulpe Colossal attacks a merchant ship. Public Domain. Unit 9 of the Big History course might seem like a monster in terms of planning. It’s by far the biggest unit, with seven separate lessons, many of which include a number of articles and activities. How is it possible to get through the best of both the Big History and world history content in the amount of time you have left in your school year? What I’ve found is that to incorporate most of the world history content—which is extremely helpful if you have state exams that require students to know a bit more about traditional historical themes—you have to do some creative chopping and changing. Here’s what my Unit 9 playbook looks like: I start with Lesson 9.0, opening the unit with the Day in the Life activity, before moving on to Periodizing Big History. Next, I do the DQ Notebook, and finally, the Threshold 8 video. I find it most useful to use the DQ Notebooks before introducing any real content from the unit, because this allows students to answer the question with very little “help” from either you or the course, which means that they will see their thinking change more than if you do this activity in the second lesson of the unit. After the Threshold 8 video, I have students read the article “Why Is That T-shirt So Cheap?,” before moving on to the Appetite for Energy activity. I follow with the Crash Course World History: The Industrial Revolution video, the Graphing Population Growth activity, and finally the article “Acceleration.” Logically, articles and activities on imperialism should follow the Industrial Revolution, which is where I place the articles “You Say You Want a Revolution” and “Imperialism and Resistance,” along with the Crash Course World History: Imperialism video. After this, I move on to the fight for rights and resistance movements, which lead to World War I, the Great Depression, World War II, and the Cold War. I’ve found that introducing world history content in this way helps students see the connections among all of these historical events. Instead of simply having students memorize the dates, places, and people associated with movements such as imperialism and the world wars, they begin to see how each one causes the next and how all of those events can be connected back to the Industrial Revolution, which is the main thrust of Unit 9’s focus on acceleration. Finally, I end the unit by going back to the articles, videos, and activities from Lessons 9.2 and 9.3, which focus on the Anthropocene and how the world has changed so dramatically from 1750 to today. All of this, of course, helps students answer the Investigation question for Unit 9. One of the most important things I’ve found in trying to incorporate all of this information into Unit 9, is that sometimes students get confused if there is too much of a focus on the details rather than the connections that should be made across these lessons and events. This focus on connections is, of course, one of the key differentiators for BHP. And these connections are also a big part of what gets and keeps students engaged—even during the hard parts—and stays with them long after they’ve completed Big History.